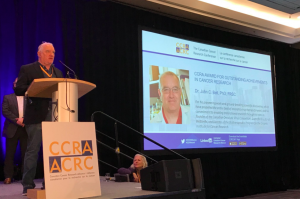 Dr. John Bell, BioCanRx’s Scientific Director, today received an award for Outstanding Achievements in Cancer Research from The Canadian Cancer Research Alliance at The Canadian Cancer Research Conference in Vancouver. Dr. Bell’s work, his ground-breaking scientific discoveries and his commitment to enabling translational research have made him a pioneer in the oncolytic virus field. Committed to “bench to beside” research, he has worked tirelessly to build the infrastructure to make these state-of-the-art immunotherapies a reality for patients, and through his participation in various community forums, he has made OV therapies understandable to patient populations. The biennial recognition program acknowledges the contributions of individuals who have had a remarkable impact on cancer research and the cancer research community. 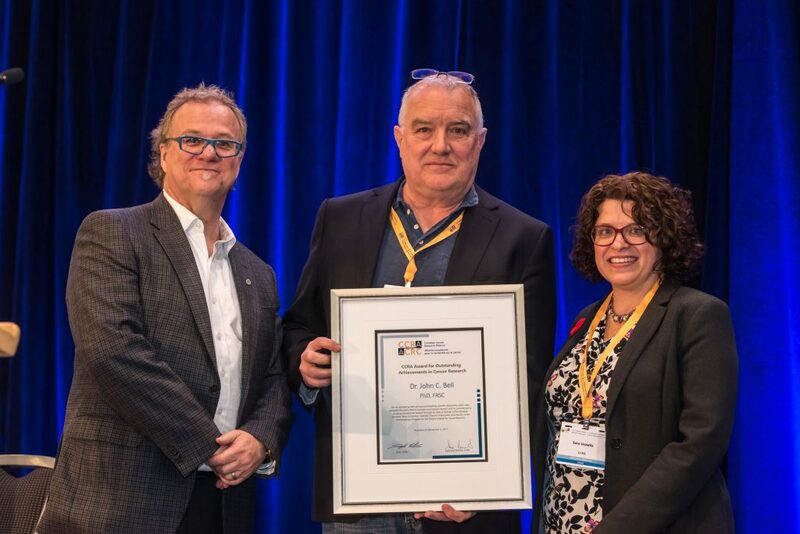 Alongside Dr. Bell, Dr. Marco Marra received an award for his Outstanding Achievements in Cancer Research. Read the full news release including details of the other award recipients. Dr. Bell is a Senior Scientist in cancer therapeutics at The Ottawa Hospital Research Institute and Professor of Medicine and Biochemistry, Microbiology and Immunology at the University of Ottawa. He is founder of the Canadian Oncolytic Virus Consortium, the first of its kind in the world, which aims to expand cancer viral therapy discovery and application at all levels and is also, Director of the Biotherapeutics Program for the Ontario Institute for Cancer Research. From left to right; Dr. Stephen Robbins, Dr. John Bell and Dr. Sara Urowitz.